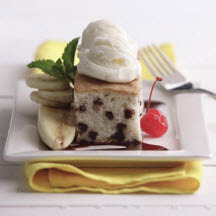 With all the flavors of the classic ice cream parlor sundae, this cake is sure to be a hit! Preheat oven to 350°F (175°C). Spray a 13x9x2-inch pan with canola oil. In large bowl, combine cake mix, canola oil, water, eggs and mashed banana. Beat on medium speed for 2 minutes. Stir in chocolate chips. Bake for 35 to 40 minutes or until tester comes out clean. Cool cake on wire rack. To serve, place piece of cake in ice cream dish. Garnish with ice cream, banana slices, chocolate syrup and cherries. Makes 24 small servings or 12 large servings. Nutritional Information Per Serving (1/24 of recipe): Calories 170; Fat 8g; Saturated Fat 2g; Cholesterol 25mg; Sodium 150mg; Carbohydrates 23g; Fiber <1g; Protein 2g.